I was fortunate enough to be able to do two different talks this year at the Adobe CFSummit 2015 conference. My first session, was a hands on Pre-Conference workshop taught by David Epler and myself, it was titled: Hack & Fix - Hands on ColdFusion Security Training. I will be speaking at the Adobe / Carahsoft ColdFusion Zeus Sneak Preview Event on Wednesday March 28th at the Crystal Gateway Marriott in Washington DC. My topic is called Boost Security Using ColdFusion Zeus: Writing Secure CFML which will cover the new security enhancements in ColdFusion 10. My Topic for the 2009 CFUnited conference was announced today: Design Diagrams for CFCs and Databases. The presentation covers creating Unified Modeling Language (UML) and Entity Relationship (ER) Diagrams. I have been asked to speak at CFUNITED Conference rather last minute on Advanced SEO - Beyond Meta Tags, and Search Engine Safe URL's. 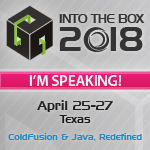 So it will be fun to attend the best coldfusion conference out there this year. Can't make it to MAX? then goto the MXimize Conference in Orlando, December 14-16. I will be speaking on "CFCs under the Hood". My talk covers UDFs, CFCs, Web Services and Flash Remoting. Early bird pricing ends November 8th. UDFs, CFCs, Web Service and Remoting. There is a survey up at the Cruise-N-Learn web site. Go over there and fill it out, it is for planning the Cruise-N-Learn MX conference in 2004 (that's right a conference on a cruise ship!). Even if you don't think you would be able to convince your boss, we would like to hear why. Actually it's on a large boat, a cruise ship and will be sailing in the Caribbean! You have until thursday (5/1/03) to signup, there is still some room left for you. I'm ofcourse talking about the 1st.